I am so excited to share a guest post from the beautiful (and YOUNG!) Ali from aliandheralmondbutter.com She has such a great spirit and takes the most gorgeous pictures. 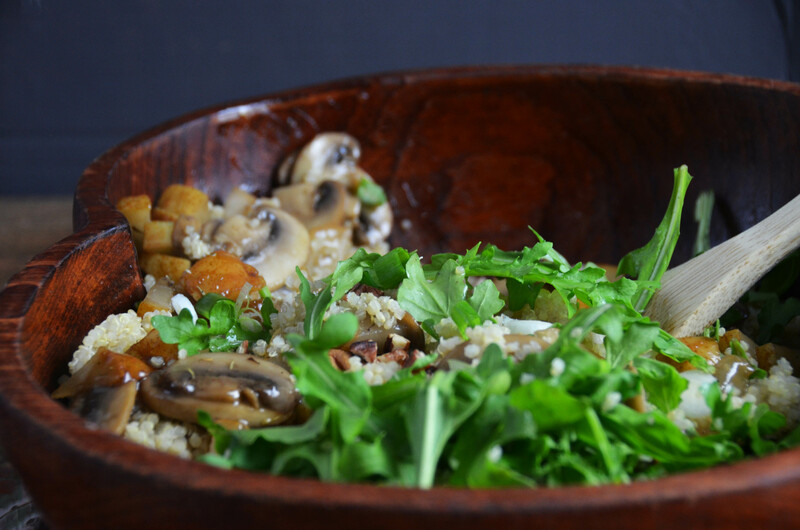 She has created a perfect fall salad for you to munch on this season. Hope you love it! Just cook up some quinoa. Toast some pecans. 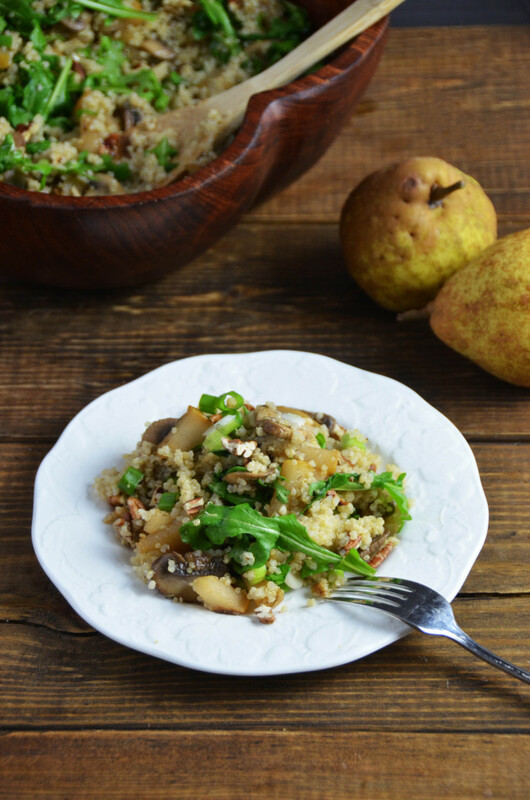 Sauté your mushrooms and pears together and make a sweet sauce to go with them. And stir all your wonderful ingredients together in a bowl. What I love about quinoa is that it isn’t an “empty carb” like potatoes (though I do love potatoes; don’t get me wrong). It is full of iron and fiber, and—most importantly—it’s very protein-rich (for any protein-seeking vegans or vegetarians). I am obsessed with quinoa. Considering the well-known health benefits of the other ingredients in this recipe (i.e. garlic, arugula), this is a very wholesome meal. A little sweet, but not too sweet. A touch of thyme. A sprinkling of scallions. My whole family loved this recipe (even the 8-year-old, I might add). So let’s get cooking! 1.Place the quinoa, water, minced garlic, and salt in a medium-sized pot or a rice cooker. Cook on low with the lid on for about 30 minutes. Or you can just follow the directions on the quinoa package. 3.Now wash and slice the pears and mushrooms. Lightly grease a large skillet with olive oil. 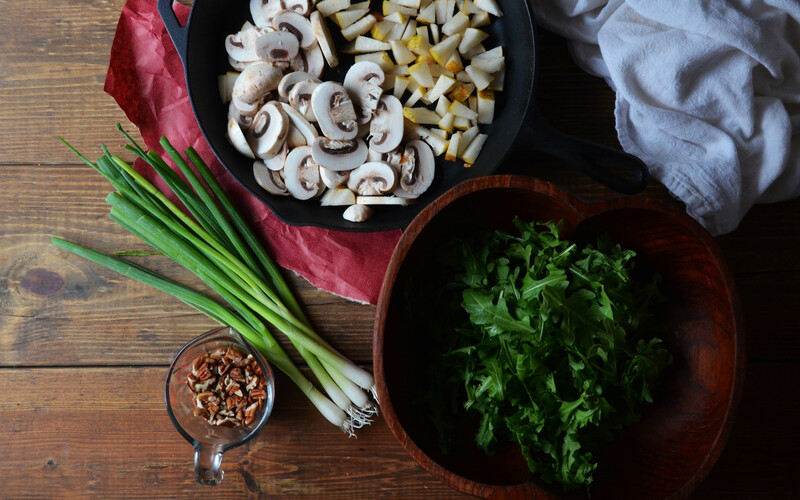 Place the pears and mushrooms in the skillet and place over medium heat. Let them cook, stirring frequently, for about 6 minutes. 4.Once the mushrooms are soft, add in sherry, salt, cornstarch-water mixture, thyme, and maple syrup. Turn up the heat a bit and cook until the sauce thickens—about 4-5 more minutes. 5.Place the quinoa in a large bowl once it is done cooking. 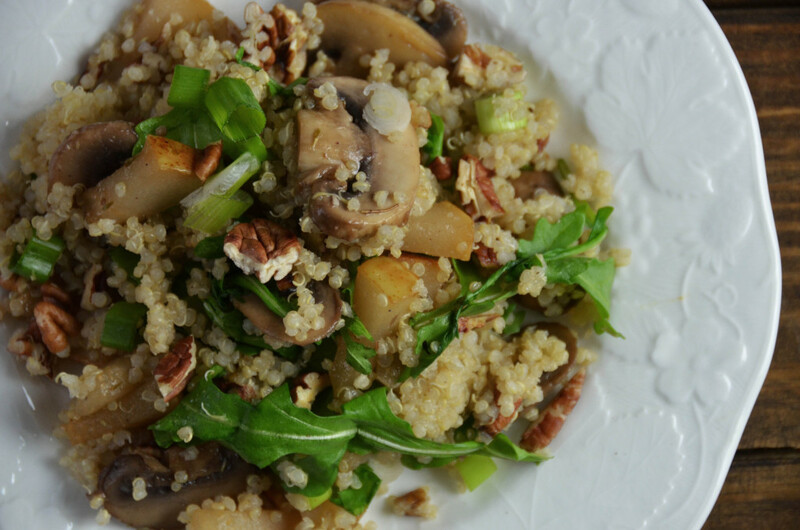 Now add in the rest of the ingredients: toasted pecans, cooked pear-mushroom combo, scallions, and arugula. Stir and serve warm. The title of this recipe grabbed me the minute I saw it in my inbox, and the click was worth my time! It looks beautiful and delicious.